Our first known interstellar visitor likely came from a two-star system. 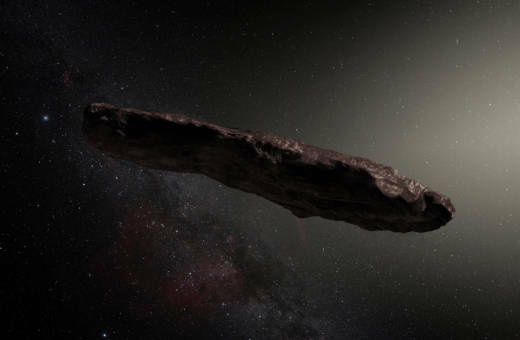 That’s the latest from astronomers who were amazed by the mysterious cigar-shaped object, detected as it passed through our inner solar system last fall. The University of Toronto’s Alan Jackson reported Monday that the asteroid — the first confirmed object in our solar system originating elsewhere — is probably from a binary star system. That’s where two stars orbit a common center. According to Jackson and his team, the asteroid was likely ejected from its system as planets formed. “It has been wandering interstellar space for a long time since,” the scientists wrote in the Royal Astronomical Society’s journal, Monthly Notices . Discovered in October by a telescope in Hawaii millions of miles away, the asteroid is called Oumuamua, Hawaiian for messenger from afar arriving first, or scout. The red-tinged rock is estimated to be possibly 1,300 feet long and zooming away from the Earth and sun at more than 16 miles per second. Last month, a science team led by Wesley Fraser of Queen’s University Belfast reported that Oumuamua is actually tumbling through space, likely the result of a collision with another asteroid or other object that kicked it out of its home solar system. He expects it to continue tumbling for billions of more years. “The same way we use comets to better understand planet formation in our own solar system, maybe this curious object can tell us more about how planets form in other systems.” Jackson said in a statement.